Your statement contains a wealth of information about your account, how to contact us, as well as a glossary that defines key terms about your home equity line of credit. 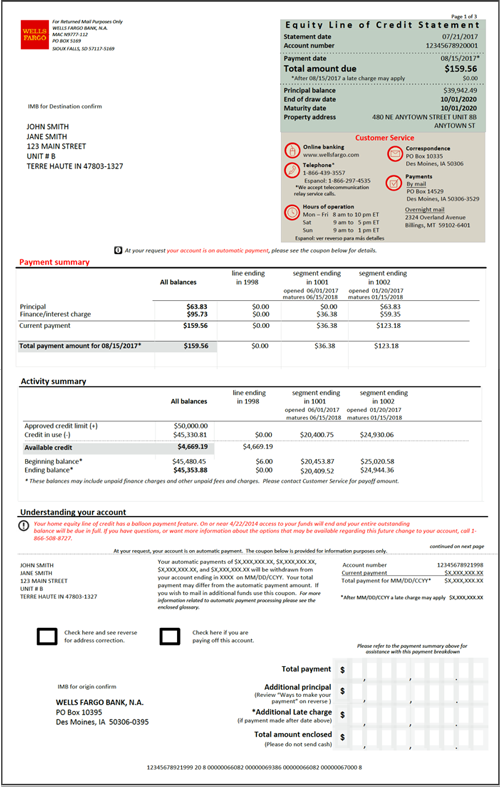 Use this online guide to view key information about your account, including your payment amount and due date, end-of-draw date, maturity date, and much more. This tour is an example of a typical statement. Depending on your account type, some of the loan segments in this example may not appear on your statement. In addition, your actual statement details may vary due to the terms and transactions of your account. This date represents the end of your draw period after which you can no longer advance additional funds from this line of credit account. You automatically enter the repayment period to pay off the outstanding balance due over a fixed period of time (or balloon) as defined by your contract. When your account reaches its end of term and all outstanding balances must be paid in full. A segment represents a portion of the balance of your account either in a fixed or variable rate pricing. Also referred to as: FRA (fixed rate advance), FRO (fixed rate option), RLO (rate lock option), or variable/promo.